IT was an easy watch for supporters of the odds-on favourite in the Le Pines Handicap at Sandown on Wednesday, the promising grey always travelling well in front for Ethan Brown - giving a nice kick over the final stages to salute by 1 1/4 lengths. It was win number two from just three starts for the son of Master Of Design who did a good job leading into a strong head-wind. "We were not expecting him to go to the front," Michael Kent said, "but maybe those were going to changed their mind with the wind. We were hoping to get some sort of sit but he pinged and Ethan knows I don't like pulling on them." And a beautiful ride it was too, Ethan Brown getting the three-year-old into a good rhythm with Kent enjoying the final stages of the race - "he just kept lengthening; he has some action for a little horse," he said. "He jumped too well," Ethan reported, adding that he was however always happy with how his charge was travelling during the race. "To do that against that win was pretty impressive," he said, "and he is a progressive type in for bigger and better things." 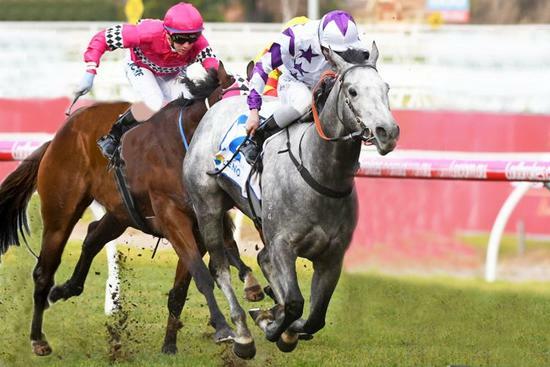 Providing Greyworm pulls up well a VOBIS race at Caulfield on Saturday week is the immediate aim.